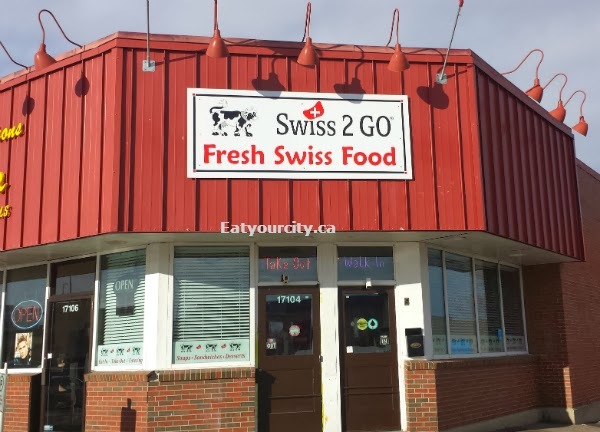 Eat Your City: Swiss 2 Go Edmonton, AB - Swiss homestyle sandwiches on pretzel bun and fab desserts! 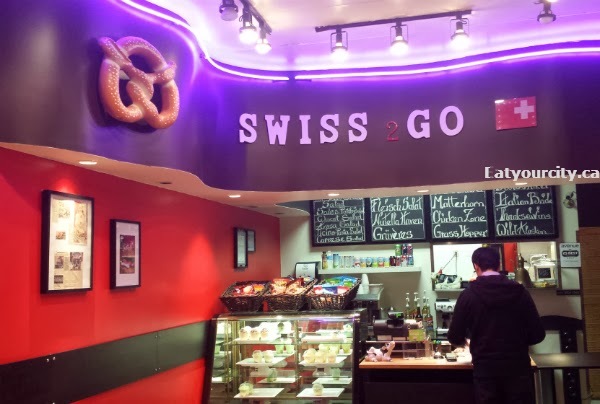 Swiss 2 Go Edmonton, AB - Swiss homestyle sandwiches on pretzel bun and fab desserts! 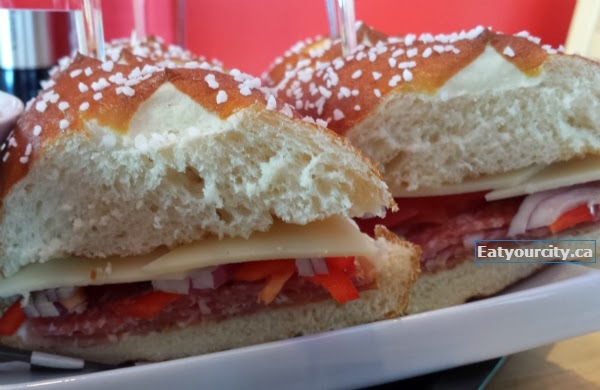 All sandwiches are made to order.. and good things come with time, so be patient! Serving sizes are generous here, and Drita will personally check up on you for feedback, because she really wants to make sure you've enjoyed her food. Drita's passion shines in the quality of the ingredients used to make the sandwiches, soups and desserts - from the fresh pretzel buns baked daily, the delicious Bresaola (Alpine-style dried beef) and cured meats, fresh vegetables, using rum and Kirsch straight from home in some of her desserts, making cream, and hand churning sweet unsalted organic butter with milk sourced from local dairies with a butter churner passed on through three generations. If all that doesn't translate into delicious food, I don't know what does! The pics that follow are from two dinners and a subsequent lunch that I put together as one single post. 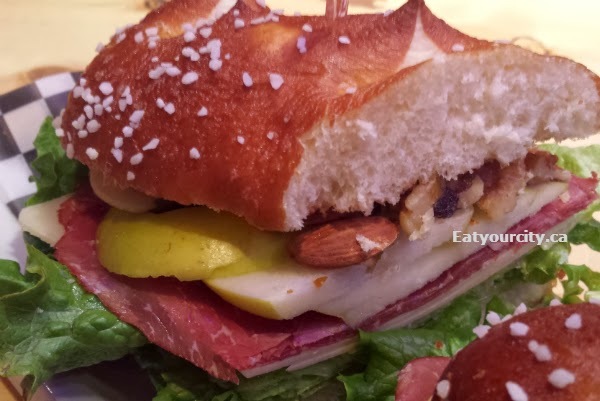 On dense and slightly chewy soft pretzel buns studded with kosher salt baked fresh every morning (ask for gluten free buns if you want them when you order), you can have a variety of choices of sandwich toppings from traditional offerings including the Bresaola (Alpine-style dried beef), to fruit and nuts, to Italian inspired sandwiches. 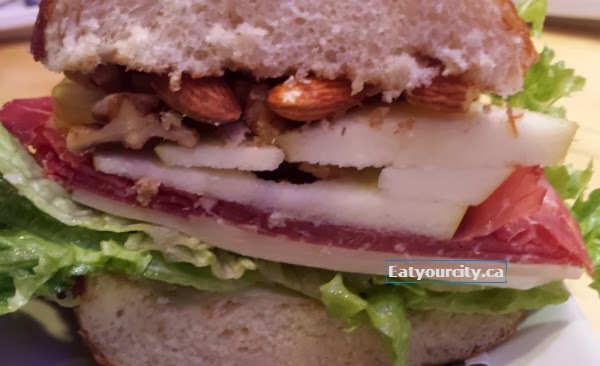 You can get small or large sandwiches, and pair them with a soup of the day or potato salad and a bottle of water and a Swiss dark chocolate if you're hungry and go with the meal deals. 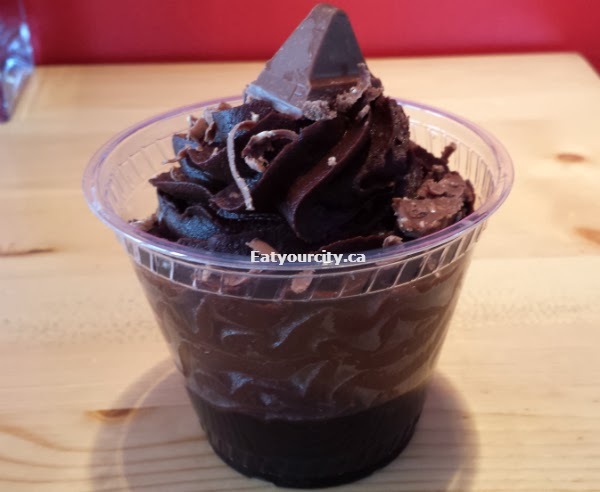 The Matterhorn, which Edmonton Journal writer Liane Faulder raved about a few months back was a must try. 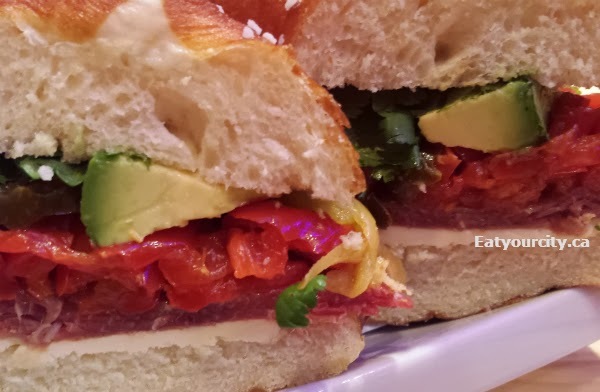 Its not for the faint of heart as Drita packs this baby full of sliced jalapeno and banana peppers, cool creamy ripe avocado, alpine style dried beef, fresh cilantro and a delectable, glorious slice of hand churned butter that tastes like a dream on the pretzel baguette. The butter is not for sale since there are only limited quantities made to go into the Matterhorn sandwich. Though if you offer to hand churn the next batch of cream for butter making for several hours and build up some serious muscle, Drita may consider it. 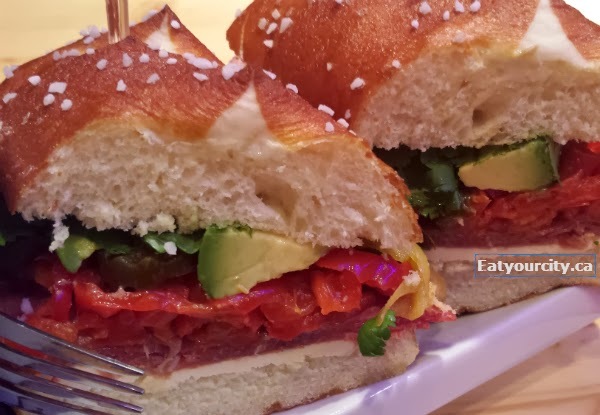 The Matterhorn packs a punch of sweet heat from the hot peppers, cooled off with generous slices of ripe avocado. 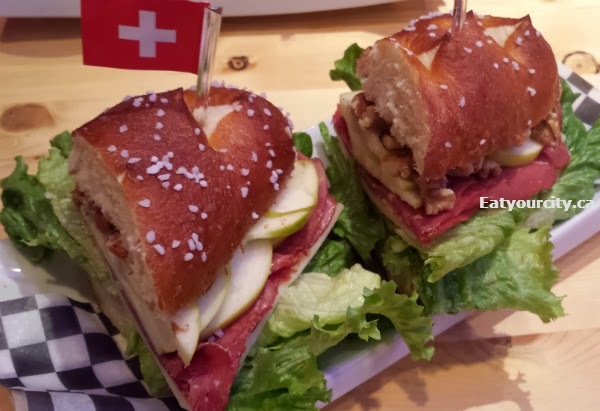 The alpine beef is a slightly salty savory delicious, while the creamy sweet hand churned butter slices (which a lot of people think its cheese) ties everything together into one delicious bite after bite. I'm a super wimp when it comes to spicy, but its soooo worth the spiciness to nomnomnom this sandwich!! I had the Arosa for dinner, as the idea of having nuts in my sandwich intrigued me. 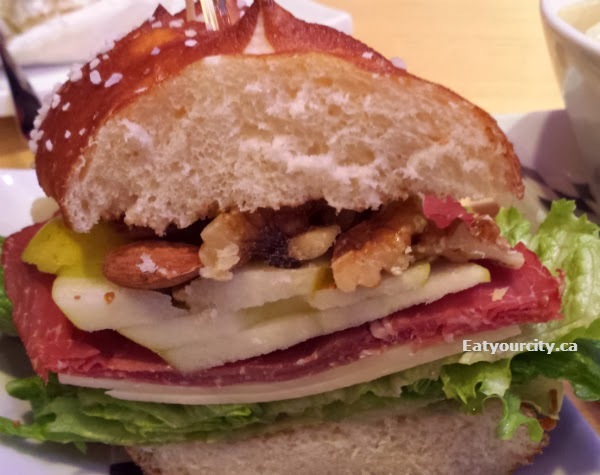 Lettuce, Alpine style dried beef, sliced hard boiled eggs, Swiss Emmental, a roasted nut mix of almonds and walnuts perched atop cool crisp apple slices drizzled with extra virgin olive oil and balsamic vinaigrette teeter inside the pretzel baguette. 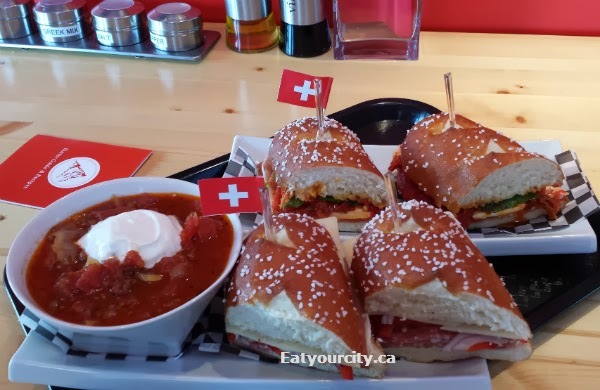 I enjoyed the Arosa, with its different salty, sweet, savory, soft, crisp and chewier elements working well together, while my boyfriend thought it was too many textures and flavors... but he prefers simple flavors. To each their own! 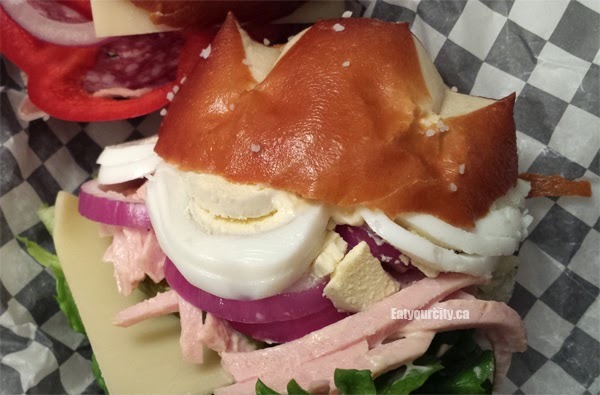 I had the Italian Bride for lunch - one as it was a super popular sandwich and winner of Avenue Magazine’s “25 Best Things to Eat in Edmonton” 2013... and I love Italian cured meats! 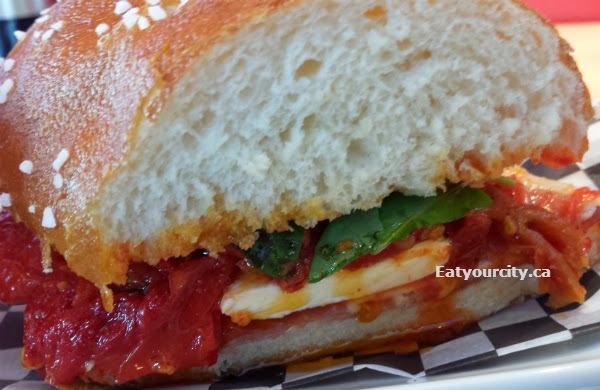 Italian prosciutto, roasted red peppers, sun dried tomatoes, creamy sliced Bocconcini and fresh basil is generously drizzled with extra virgin olive oil and balsamic vinaigrette... its a messy sandwich, but my, is it ever a tasty sandwich!! Its a salty, sweet, savoury, creamy… nomnomnom! For another dinner.. and late night snack (heehee.. the sandwiches are so damn good!) 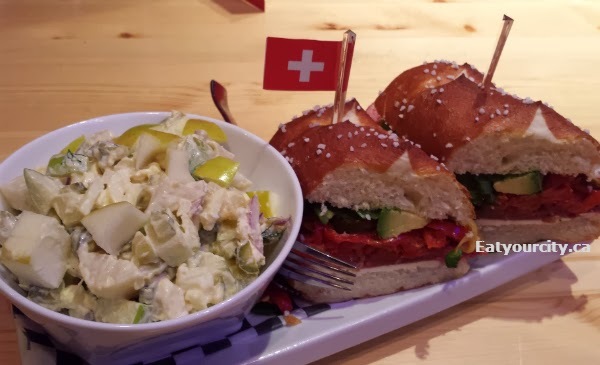 the Fleisch Salat (Meat salad) is Drita's take on homemade Bavarian meat loaf topped with Swiss Emmental, a big slice of dill pickle, purple onions, hard boiled eggs mayo and mustard stacked/crammed inside a freshly baked pretzel bun. 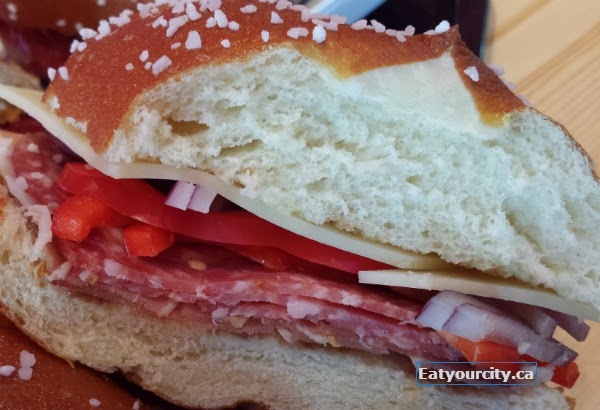 We initially thought it didn't come inside a pretzel bun due to its name, but it does! 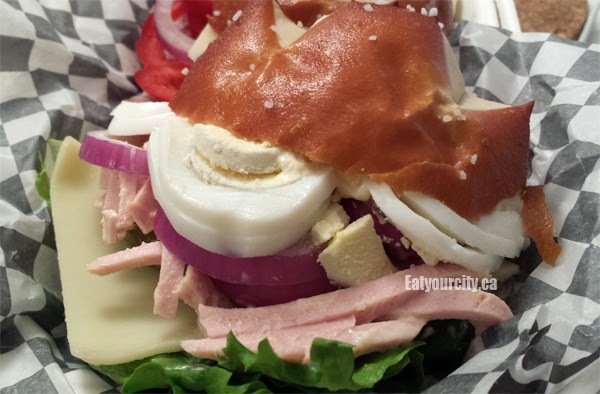 We had the small portion - so it comes as a single round pretzel bun rather than the longer submarine large pretzel bun. This sliced up tasty meatloaf (made of corn beef, pork, bacon and onions) resembles more of ... well, ham than a traditional North American meatloaf along with the toppings.. this is a egg-"salad" most meat-a-tarians would be more than happy to nosh on every day. Its a hearty, and very very filling sandwich.. nom! They had run out of soup of the day one of the evenings we went to eat dinner, so we had the Potato salad as a side to go with the Matterhorn sandwich. My boyfriend who normally doesn't like potatoes in general, polished off half the bowl before I had a chance to finish taking pictures of the other sandwiches we ordered! 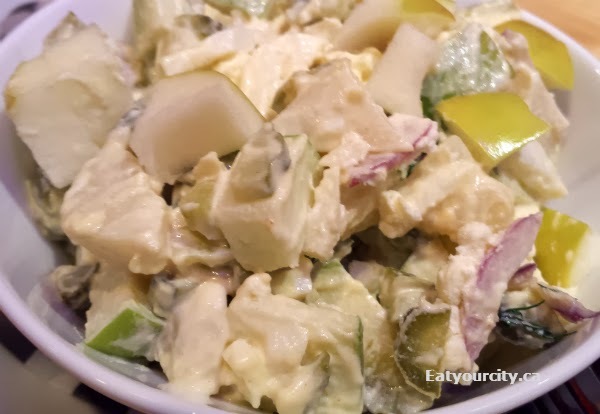 Soft bite tender cubes of potato, plenty of pickles, hard boiled eggs, red onions, crisp apples and a light bite of hot mustard rounds out this creamy awesome potato salad I practically had to fight for to have a taste. 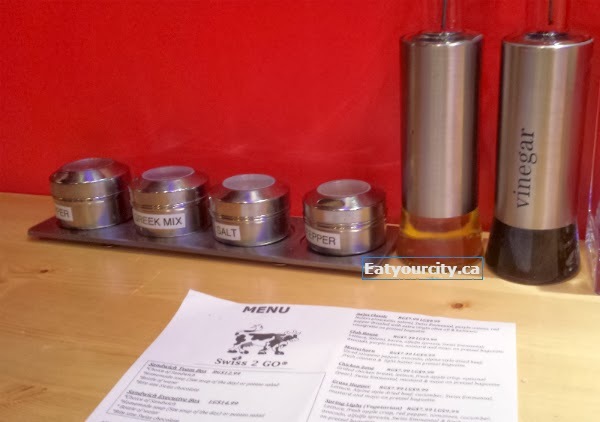 For lunch, the soup of the day was Alpine beef, which Drita kindly gave us samples to try.. and we we sold after one sip! 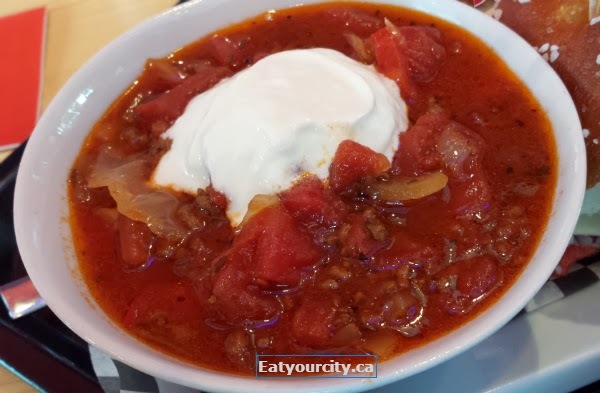 Lots of ground beef swims in a hearty vegetable studded tomato based soup that reminded us more of a homemade chili that soup... its a meal in itself! 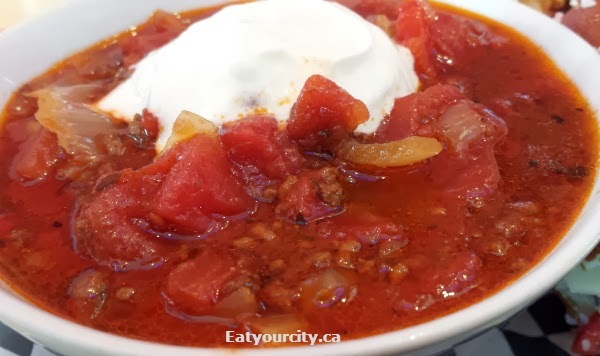 Its topped with a big dollop of Greek yogurt that gives it a creaminess that reminds me of the sour creme we like putting on top of borscht. Mmmmm! And you have to save room for dessert. Pack your sandwiches, soups and salads.. 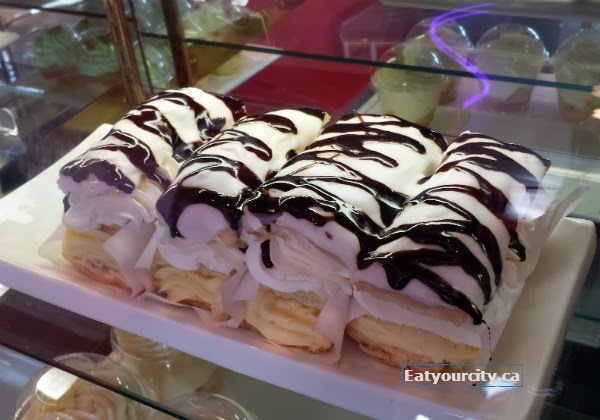 I don't care how you fit it in, but the Cremeschnitte or Napoleon is a must try from the dessert case full of sweet desserts that beckon you when you first arrive at the counter. 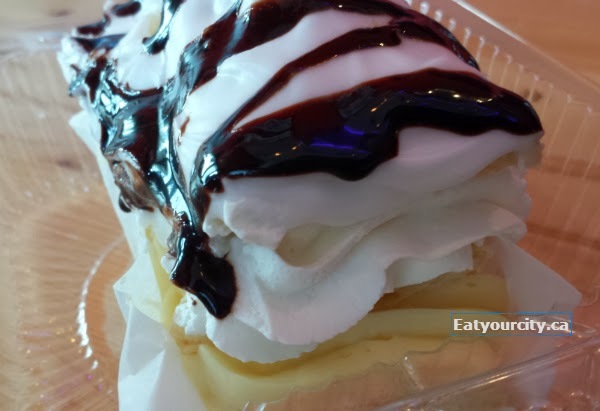 What is a Cremeschnitte or Napoleon? 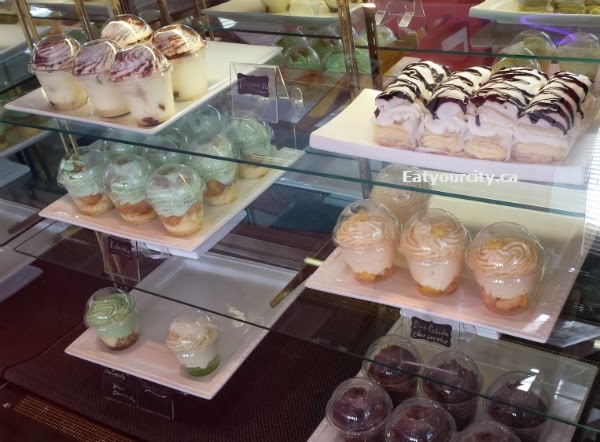 Its calling your name... and we had every single time we stopped by lol! 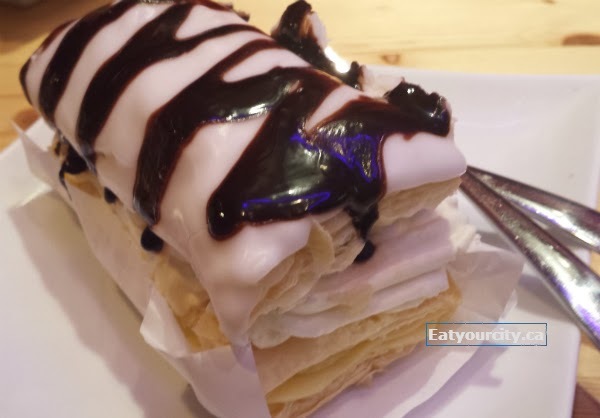 In the morning, the thin layers of flaky pastry is crisp, and becomes softer as the day goes by as it sandwiches layers of lightly sweetened custard, a ridiculous amount of lightly sweetened whipped cream, repeat layers of whipped cream and pastry... all crowned by rum laced icing and drizzled with chocolate sauce. Hubba hubba!!! Drita laments she's only allowed to put a maximum of 2oz of alcohol per serving in select desserts she makes instead of the higher amount "there should be the way we make it at back at home". (Not all her desserts have rum, kirsch or amaretto in it) Let me repeat that… only 2oz per serving. LOL.. she puts in as much per serving as most other eateries plugs into an entire dessert meant for many many servings! Ah, Drita.. I just want to pick you up and hug you! There's tiramisu, which we've heard was quite good, cheesecakes and pistachio version of tiramisu? but I'll have to try those next time as Drita had made a dark chocolate Toblerone mousse that morning, and we tried it instead. 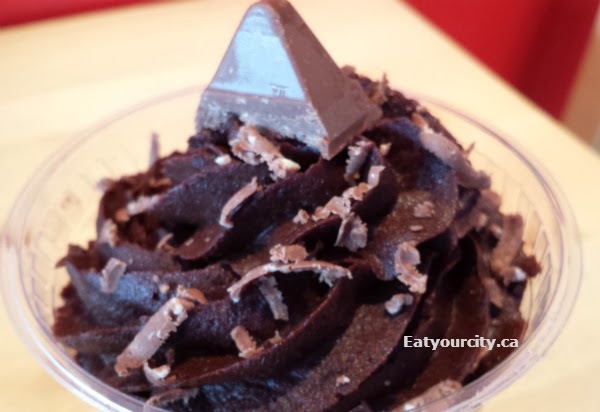 While there wasn't a lot of Toblerone flavor in the mousse itself - as a creamy, dark, rich and sinfully dark chocolate mousse, its a winner! 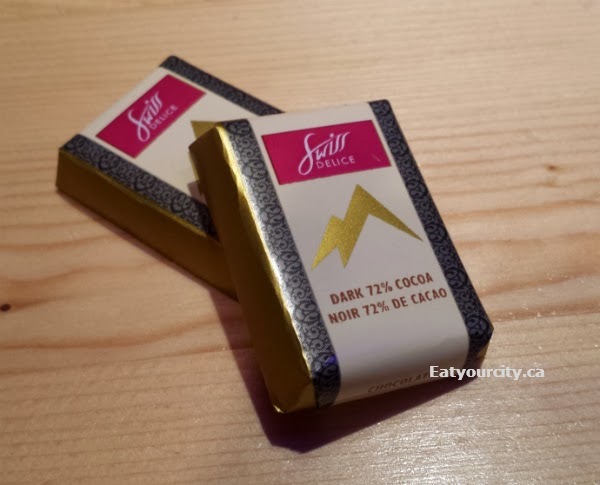 All meal deals come with a Swiss dark chocolate.. 2 if you ordered 2! Its delicious. Its awesome quality ingredients. Its the crazy addictive Cremeschnitte. And its the passion that shines in the food. 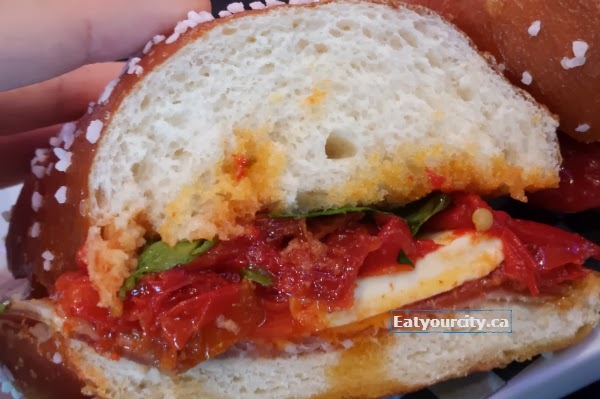 Looking forward to trying out their new spicy and juicy seasoned meatball sandwich which they're launching soon… we got a sneak taste of the meatballs one day as Drita was making some and offered us some to try! Desserts change daily depending on what Drita feels like making… I hope she makes some traditional Black Forest cake sometime.. she drowns it in Kirsch wheee! So do, go eat, eat more, and save room for dessert... you won't be disappointed.